Der CR9000X ist ein modular aufgebautes Multiprozessorsystem in einem robusten Gehäuse. Es besteht aus einem Basissystem und dem Gehäuse mit Einschüben für bis zu 9 wählbaren I/O-Modulen. Der CR9000X ist unser schnellster Datenlogger mit einer Messrate von bis zu 100.000 Hz und damit ideal für Anwendungen, bei denen schelle Messungen erforderlich sind. Hier finden Sie eine Liste der erhältlichen I/O Module für den CR9000X und CR9000XC. Campbell Scientific bietet auch eine Kompaktversion an, den CR9000XC, der bis zu 5 I/O-Module aufnehmen kann. The CR9000X's base system includes a CR9032 CPU module, CR9041 A/D module, CR9011 power supply module, and 128-MB SDRAM memory for program and data storage. The CR9000X's internal battery has a 14-Ahr capacity. A mix of I/O modules is selected based on the measurements required for the application. Campbell Scientific offers a large variety of modules. 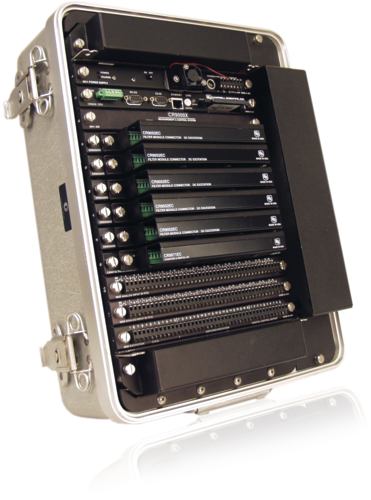 Individual I/O modules can be swapped out, allowing the system to be reconfigured if requirements change. I/O modules whose model numbers end in an E (e.g., CR9051E, CR9055E) and the CR9052DC include an easy connector module. Easy connector modules allow sensor wiring to remain connected while the input module’s measurement electronics and the rest of the datalogger system are used elsewhere. The CR9000X has a choice of enclosure. The environmental enclosure is designed for field applications, where the enclosure will be exposed to the elements. The lab enclosure is for applications where the CR9000X will reside inside a building. In August 2004, the CR9000X replaced the CR9000. The CR9000 and CR9000X dataloggers differ in their CPU Module; the CR9000 datalogger uses the CR9031 and the CR9000X datalogger uses the CR9032. The CR9032 CPU module supports a measurement rate of up to 100,000 Hz, provides a 180 MHz clock speed, and adds a built-in RS-232 port, 10baseT/100baseT port, CS I/O port, and PC-card slot. The built-in ports enable communication without using the special interfaces (e.g., PLA100, TL925, NL105) that were required for the retired CR9000 datalogger. The PC-card slot allows the CR9000X to store data on a Type I, Type II, or Type III PCMCIA card, or on a CompactFlash® card if an adapter is used. A CR9000 may be upgraded to a CR9000X by replacing the CR9031 CPU module with the CR9032 CPU module. Additional specifications are listed in the CR9000X(C) Specifications Sheet. For the CR9000X, the current drain, weights, and specific number of input/output channels depend on the I/O modules chosen. Customers can add CR9000X dataloggers to networks containing the older CR9000 or CR9000C dataloggers. I/O modules other than the CR9080 can be used with either the CR9000 or CR9000X. CR9000 communication interfaces (i.e., NL105, BLC100, TL925, PLA100) are not compatible with the CR9000X, and therefore have been retired. With several channel types, the CR9000X is compatible with many sensors, including thermocouples and 4 to 20 mA sensors. Measurement and control peripherals typically used with the CR9000X are our AM25T 25-Channel Solid State Multiplexer, SDM-CAN Interface, SDM-INT8 Eight Channel Interval Timer, and SDM-SIO4 Serial Input/Output Module. Other measurement and control peripherals are compatible but they do not support the CR9000X datalogger's maximum measurement rate and are therefore impractical for most CR9000X applications. The CR9000X typically communicates with a PC via direct connect or Ethernet. Because the CR9000X has an on-board 10baseT/100baseT port, an Ethernet interface such as the NL201 is not required. Storage capacity can be increased by using a PC or CompactFlash card. The CR9000X's PCMCIA card slot supports one Type I, Type II, or Type III PC Card or the CF1 adapter and one CompactFlash (CF) card. The storage capacity of Type II cards exceeds 1 GB. Type III cards provide data storage capacities exceeding 1 GB but may not be suitable for all environments. Campbell Scientific offers several CF cards that have passed our ESD testing and operate properly with our data loggers (see Ordering tab). Please note that the PCMCIA and CompactFlash cards need to be industrial-grade and have a storage capacity of 2 GB or less. Other communication peripherals are compatible but they do not support the CR9000X datalogger's maximum measurement rate and are therefore impractical for most CR9000X applications. Two enclosures are offered for the CR9000X. The 8253 fiberglass environmental enclosure is designed for field applications where the enclosure will be exposed to the elements. The 8255 lab enclosure is for applications where the CR9000X will reside inside a building. CRBasic, the CR9000X's full programming language, supports simple or complex programming and many on-board data reduction processes. CRBasic is included in RTDAQ, LoggerNet, and PC400. RTDAQ Real-Time Data Acquisition Software must be ordered separately; the CR9000X is also compatible with other Campbell Scientific software. Current Operating System, Compiler and CR9000X support files for the CRBasic Editor. Requires the Device Configuration Utility, LoggerNet or RTDAQ to upload. Upgrade PC9000 version 5.0, 5.1, 5.2 or 5.3 to 5.3.1; no intermediate steps are required. PC9000 5.0, 5.1, 5.2 or 5.3 must be installed on your machine. What are the differences between the CR9000X and the CR9000XC? The CR9000X and CR9000XC differ only in the number of I/O cards they can hold. The CR9000X can hold 9 I/O cards, and the CR9000XC can hold 5 I/O cards. We provide both sizes to accommodate our customers; the same I/O cards can be used in either chassis. What is the largest memory card that can be used with a CR9000X? What is the difference between the various bridge measurements? The advantage of the BrHalf4W circuit is that the effect of lead resistance is measured and compensated for. The disadvantage is that it requires two differential (four single-ended) voltage input channels and four wires to the sensor. Some sensors have four wires and are sensitive enough that the lead resistance would cause too great an error. The BrHalf, a two-wire measurement, does not compensate for lead resistance. The BrHalf3W lead compensation assumes that both leads are of the same resistance. Is there a way to only record measurements during the daytime and put the datalogger in sleep mode during the nighttime to conserve power? Yes. The simplest method is to use conditional program statements that execute most of the code based on time. For example, the data could be scheduled to log at 6 a.m. and finish at 8 p.m. using CRBasic instructions such as TimeIntoInterval(). Another option is to use an IfThen/EndIf construction that does a logical test of light-level measurements based on a light sensor. An additional option is to use calculated sunrise and sunset times along with a combination of RealTime() and Case instructions. What needs to be done to measure ST350 Strain Transducers using a Campbell Scientific datalogger? What is checked during the calibration of a Campbell Scientific datalogger? All the input terminals, peripheral and communications terminals, operating system, and Flash EEPROM are checked. The datalogger is checked to ensure that all hardware operates within published specifications. When will a datalogger reset the switched 12 V channel (SW12)? The datalogger will not reset the SW12 unless it is done under program control using the SW12() or PortSet() instructions, or unless the datalogger compiles or recompiles a program. This could be done when a new program is sent to the datalogger, or if the power is cycled. If an RF modem is used to communicate with a datalogger and a PC running LoggerNet, but the modem baud rate is one third of the datalogger baud rate, is that a problem?